Wait times and crowding still an issue as attendees revel in pop culture. 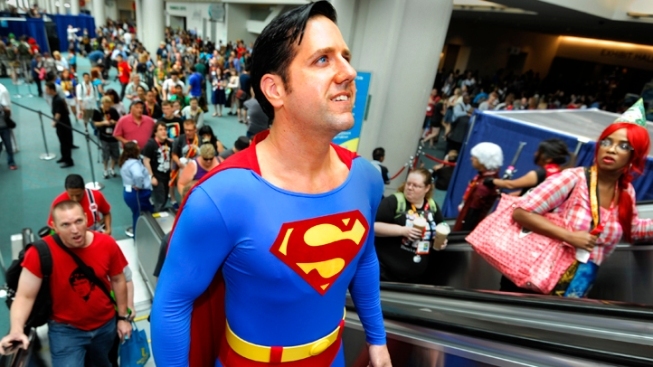 Over 125,000 conventioneers, including Superman, crowded into Comic Con at the San Diego Convention Center. Comic-Con International is the location where pop culture fans cross paths - regardless of whether you are Superman obsessed, a dedicated follower of "Doctor Who" or just wild about "The Big Bang Theory." The four-day festival of comic books, movies, television and digital games drew to a close Sunday with the San Diego Convention Center packed with final-day attendees - many in costume - making last-minute purchases and posing for pictures with life-sized Star Wars' droids and blood-thirsty zombies. Over 125,000 conventioneers witnessed more than 600 hours of official programming and crowded the trading floor to snap up limited-edition merchandise and hard to find back issues. The event has an estimated $180 million impact on the city each year, according to the San Diego Convention and Visitors Bureau. "The zombies freak me out," said Brooke Corson, attending for the first time alongside her brother Heath. The siblings, who grew up in Chicago and now reside in Los Angeles were both taking positive experiences away from the event. Heath, in town for Stan Lee's World of Heroes Youtube Channel panel is the executive producer of "Super.Model," a new web series set to air on the channel and has attended since 2006. "My sister is amazed at how nice everybody is here," he said. "I've never seen anything like this," added Brooke. "I'm having a great time. This many people being so happy in this space. I know most conventions people go to are work conventions. So to have this opportunity and have the people see the shows that they want to see. If I get into the "Doctor Who" panel - I'll be bouncing off the walls." Brooke got her wish and gained access to Sunday's panel, albeit after a two-and-a-half hour wait. The most common complaint at Comic-Con always involves time spent spent queueing. Especially if, like the "Who" fan-fest, the subject of their adoration is being hosted in the biggest venue of the convention center - Hall H which seats 6,500 people. Many fans waited over five hours for the big Hall H draws such as "The Walking Dead," "Iron Man 3," "The Hobbit," the final appearance of "The Twilight Saga" and "The Big Bang Theory," where one lucky fan won a trip for two into space. Some even camped out overnight in an effort to ensure a glimpse of the actors from and a sneak peek at their favorite franchise. "Maybe next year they should just take over Petco Park and have room for everybody," quipped Heath. Perhaps the 42,000 seat stadium adjacent to the convention center and home to the San Diego Padres may be overkill, but the extra capacity and multiple entries and exits would alleviate some of the current time constraints.The organizers of Comic-Con did not return calls for comment at the time of publication. For many like regular attendee Heath, it's still all about the comic books. Though he does have reservations about having to trek to the far end of the convention center floor where the majority of purveyors have been relegated. "It's the comic book ghetto these days," he says of the demand for space from big studios and gaming companies. Location didn't appear to be a concern for Melissa Morales. She was fielding brisk business Sunday afternoon working the Comic Central stand. As throngs flipped through stacks and asked questions regarding hard-to-find issues and story lines, Morales admitted that for the business "Saturday wasn't as busy as it has been for the past couple of years, but today has been extremely busy." Based out of Sanford, Fl. 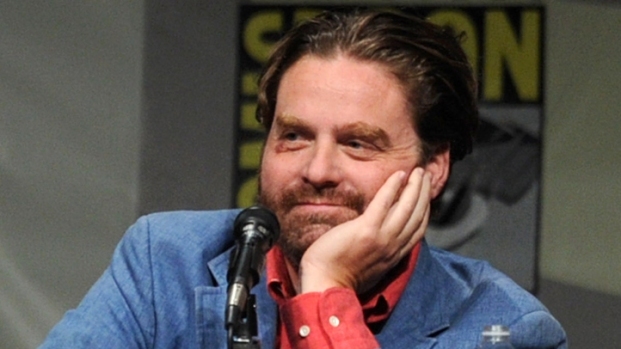 the store has been a constant at Comic-Con for the past 16 years and business appeared to be up in 2012, according to Morales. It has been year on year. And the customers? "Every one is being really friendly." It's that a sense of camaraderie that helps maintain smiles throughout the long waits and constant jostling by crowds toting over-sized and often over-stuffed bags. "You chat to people in line. We're all here for the same reason," said Heath. "I think if you have any interest in this realm, of any piece, you should totally come," said Courtney Herring, attending for the first time with her husband Dan (dressed as Thor Saturday). The Southern California natives are in the process of moving to Minnesota and were happy to witness the pop culture festival before trekking east. Long lines aside, the Herrings are glad they came but warn those considering attending next year to get organized and get informed early. "The past couple of years we talked about coming but we couldn't get tickets," said Courtney. "This year we followed the Twitter feed and the website enough that we knew when we could register to get tickets." Some regular attendees were angered upon learning that pre-registration for ticket purchases for 2013's convention will now only be available online. Previously, ticket holders could join another line at the event to ensure they were eligible to buy passes for the following year. Under the new rules, only those that have purchased a Comic-Con 2012 4-day attendee or 1-day attendee badge will be eligible to participate in 2013 online preregistration. According to Dan, once you get the registration it's a very fair process. Still, would they consider making the voyage next year all the way from Minnesota? The response was in the affirmative. "We went to the Star Trek convention in Vegas a few years back and it was twice as expensive for one topic," said Dan.